The Mill Hill School Foundation has received a donation of £1,000,000 this year, perhaps the first gift of this size for more than a 100 years (making allowance for the changing in value of money during that time); half is to be spent at Belmont and half at Mill Hill. This is wonderful news and will make a massive difference to our ability to complete two major projects in time for Autumn 2019. At Mill Hill the McClure Music School will undergo a major refurbishment. With music at the Mill Hill School Foundation being such a vibrant and exciting feature of life here, this is fantastic news. We are extremely grateful for the generous support from our parents, alumni and friends of the School. Such support helps to advance these plans and maintains our position as one of the foremost Day and Boarding Schools in London. Fundraising is also central to providing places to talented and deserving children whose parents cannot afford the fees. Our A Better Chance (ABC) Bursary Scheme does just that. Mill Hill’s Governors are committed to increasing the number of places that the school can provide in this way. Our bursary beneficiaries enrich the School, providing both talent and social diversity. If you feel that you can include Mill Hill in your charitable giving then we would be delighted to discuss with you how you might like to be involved. Get in touch. 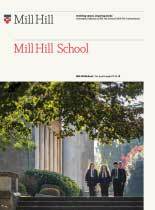 Mill Hill School Foundation is a registered charity (number 1064758) and most donations can be made under the Gift Aid Scheme.